One of the most important products to familiarize yourself with when you own a ProSource® franchise is hardwood flooring. There is a lot to learn about this beautiful flooring option, so we will start with this basic overview to give you an idea of what types of products we supply to our trade professional members. There are several reasons why hardwood flooring is such a popular option for homeowners. First of all, hardwood flooring is aesthetically pleasing. It’s an elegant flooring option that also adds warmth to any home. Depending on your furniture, hardwood flooring can create the illusion of more space in whatever room it’s installed. Many homeowners create inviting spaces by installing hardwood floors, which always leave a lasting impression. Hardwood floors are pretty easy to keep clean. You can sweep, vacuum, or steam-clean them when they get dirty. Unlike carpeting, you don’t have to worry about your flooring collecting pet dander or dust mites. They are also more stain resistant than carpets — if you spill, simply wipe it up as quickly as possible. Hardwood flooring is incredibly durable. While it is possible to scratch and dent hardwood flooring, it is a lot more difficult than other types of flooring. With proper care, hardwood flooring lasts for decades. For homeowners who plan to sell their homes one day, installing hardwood flooring is a smart choice. Hardwood floors are incredibly desirable to home buyers. When shopping for a home, it’s common for people to want to rip out carpeting from the previous owners in favor of hardwood flooring, so when they see a home with hardwood floors already installed, they are willing to pay more for it. Hardwood flooring is a superior material to choose when indoor air quality is a priority. Whereas other types of flooring, such as carpeting, traps dust, dander, pollen, and dirt, hardwood floors don’t have fibers on which these allergens can cling. Hardwood flooring is easy to customize to any room or decor. Because there are so many different types that come in a variety of patterns, colors, textures, and styles, there is likely a hardwood flooring option that will be attractive to a number of our members’ clients — we have more than 50,000 products, after all. Finally, hardwood flooring is one of the longest lasting flooring options. When properly maintained, it can last for generations. Traditional hardwood floors use solid wood cut into boards. Engineered hardwood flooring looks like real hardwood, but it is slightly less costly. Essentially, solid hardwood flooring is milled from a single piece of wood, while engineered hardwood flooring uses a base made of multiple layers of compressed wood, resin, and polymers that is topped with real hardwood. Solid hardwood is a longer lasting option because it can be refinished over and over again, while most engineered hardwood floors cannot handle this. Solid hardwood flooring is subject to more issues and is therefore harder to maintain, and engineered hardwood is much easier to install. In the end, which one to choose all comes down to preference. Clients will also have to choose whether they want their floorboards prefinished, or if they want them installed unfinished and then finished. Unfinished flooring is more customizable and because it is installed and then sanded, it is also smoother. The costs of materials are less expensive, but because it takes a lot of extra labor, installation costs are generally higher. It also takes much longer to install. Prefinished wood floors are available in many colors, but cannot be customized to a certain shade. Materials costs more upfront, but because they are easier to install, the cost of labor generally goes down. Prefinished hardwood flooring also doesn’t involve exposure to dust or toxic fumes during its installation process. There are many, many different species of wood you can use for hardwood flooring, so we will go over some of the most popular here. The important thing to keep in mind when considering wood species is the Janka Hardness Scale, the industry standard for determining the hardness of wood. The higher the number, the harder the wood, and as a result, the more durable the floor. Oak: Oak comes in two different types, red oak and white oak. Red oak is the most common choice for hardwood flooring. 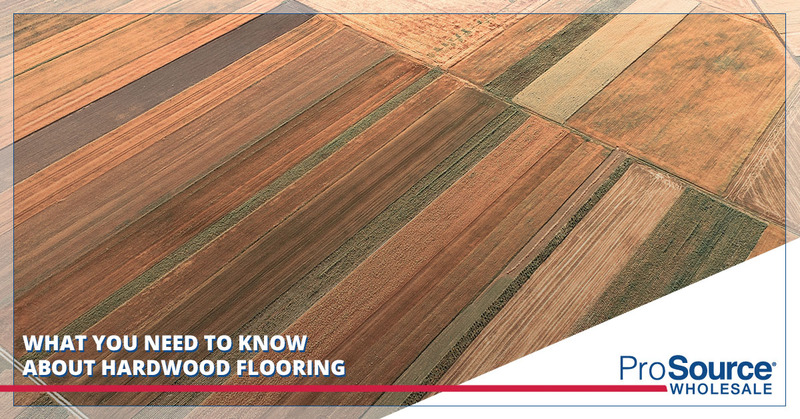 It has a Janka rating of 1290, making it durable enough for most flooring needs. Its color ranges in tone, from a soft pink to a rusty brown. White oak is harder than red oak at a 1360 Janka rating, which makes it a great choice for hallways and other rooms that get a lot of traffic. Its colors range from white to dark gray. Cherry: Cherry is a coveted hardwood flooring option because it comes in a warm brown color with a gorgeous grain pattern. It is a bit softer than oak at a 950 Janka rating, which means it is best suited for low traffic areas. It darkens in direct sunlight and most commonly comes in wide flooring planks to show off its smooth grain pattern. Walnut: Walnut comes in a deep, chocolate color with straight grain patterns, so it’s best suited for a sophisticated aesthetic. It’s Janka rating is 1010, which means it isn’t ideal for high traffic areas as it will show wear over time. Walnut looks smooth and consistent between boards. Hickory: Hickory is an incredibly durable species of wood, with a Janka rating of 1820. It is well-suited for high-traffic areas as a result. Its color ranges in tone from light beige to warm brown. It offers a rustic look because its color varies from board to board and large knots can be seen. Maple: Maple is also a durable hardwood flooring choice with a Janka rating of 1450. It’s a light-colored wood with hues that range from light cream to deep tan, and often has a red undertone. Maple has a fine grain pattern, and features some dark streaks and specks. There is much to learn about hardwood flooring when you are a flooring wholesaler like us, and we are happy to pass on our knowledge. Stay tuned for future blog posts where we go over other aspects of this product, as well as more of the 50,000 we offer. If you’re interested in our franchise opportunity, we’d like to speak with you to see if we’re a good match. Contact us.